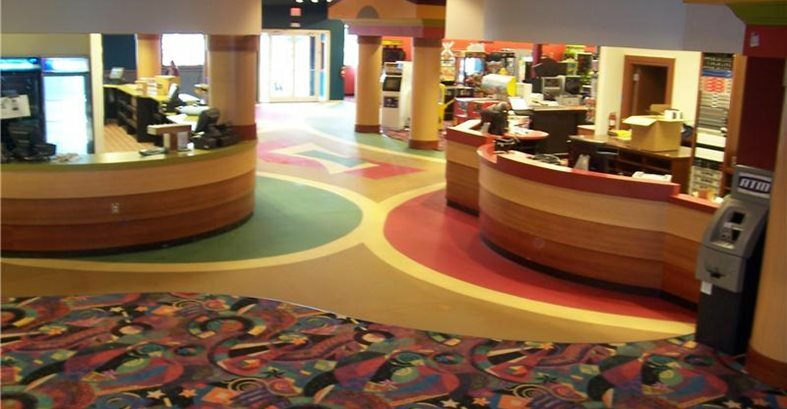 Water-based concrete stains add vibrant color to bowling alley floor Project submitted by Corby Martinez, Impressions Decorative Concrete, Lutz, Fla. The stained concrete entryway in the Alley at South Shore features a bright array of colors that complement the adjacent rug pattern. Martinez used four colors of water-based stain on this project, separating each field of color with painter's tape to create the design. A close-up of the finished floor, which is sealed with a clear, high-gloss polyurethane. Walking into the entryway of the Alley at South Shore in Riverview, Fla., is like opening a box of Crayola crayons. You'll see almost every color of the rainbow, mixed together in a dazzling array. This 42,000-square-foot bowling and family entertainment center features 32 lanes, a snack bar, pro shop, and game room. It's a lively place designed to appeal to both kids and adults. "It is brightly colored, airy, and whimsical," says Corby Martinez, president and owner of Impressions Decorative Concrete. "The front entry is an open gaming area for kids, with a colorful carpet that actually glows in the dark." Complementing the carpet is a 1,200-square-foot concrete floor with a fun, eye-catching graphic treatment created by Martinez with his own box of crayons -- L.M. Scofield's Lithochrome Tintura Stains in the colors of Razz-ma-tazz Red, Evergreen, Wheat Grain, and Autumn Honey. "You would wonder how this mix of colors would work next to each other, but we were excited to see the outcome," says Martinez. Although the concrete floor was newly placed when the project began, some prep work was required before stain application to fill defects and sawcuts caused by construction work. Once the floor was prepped, lightly sanded, and cleaned, Martinez and his crew started creating the design using painter's tape, according to a floor plan supplied by architect Ron Ellman Associates. He then applied the red and green stain colors first, followed by the lighter wheat and honey tones. "We felt that if the red and green penetrated through the tape design, which is always a chance, we could place the lighter colors over the darker colors so they would not show through as strongly," says Martinez. The Tintura line of stains is water-based and comes in a vivid palette of bright hues. "Tintura sits on the top of concrete, like a layer of skin," says Martinez. "It doesn't burn or penetrate like traditional chemical-based acid stains. This is what makes this material exciting. If you ask for Red Razz-ma-tazz you get RED." The stain also leaves no residue to remove and dries within 3 to 4 hours. 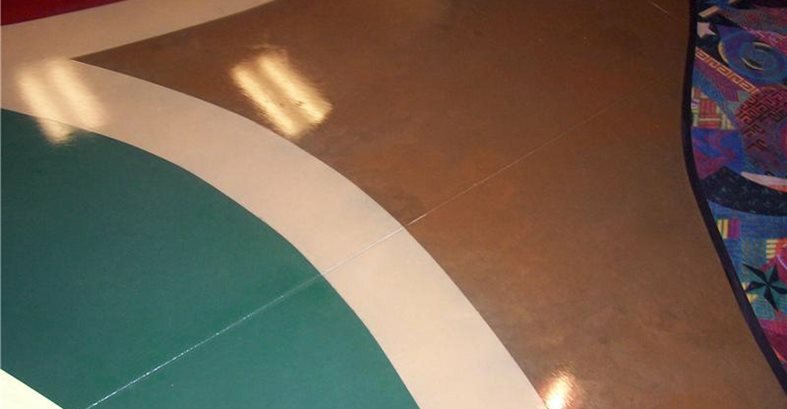 This allowed Martinez to seal the floor the same day, using a clear polyurethane (Scofield's Selectseal) to help protect the floor against heavy foot traffic. The entire project was completed in only two days. Martinez stresses that sealing the floor doesn't eliminate the need for periodic maintenance. "Maintaining these types of decorative surfaces is important. Waxing, depending on the amount of traffic, should be done on a regular basis to maintain the longevity and beauty of decorative stained floors. 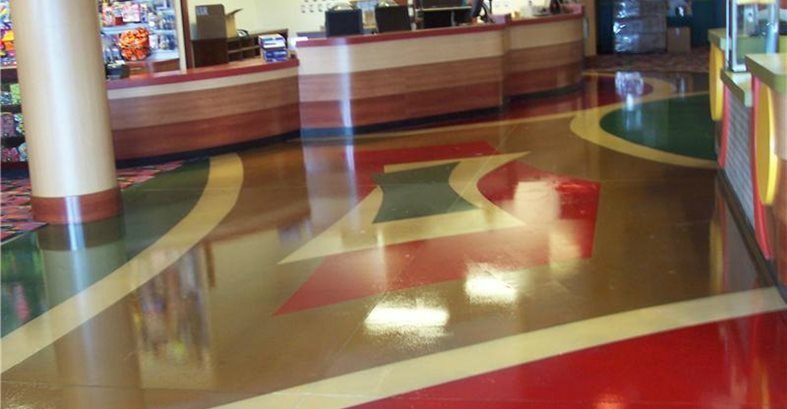 Impressions Decorative Concrete has been in business since 1991, specializing in both commercial and residential concrete work, from stamping and staining to resurfacing existing concrete. The company is continually experimenting with new designs and color blends to give their clients something unique. "Whether it's an interior or exterior project, there's an elegant decorative concrete solution for any new, existing, or troubled surface," says Martinez.